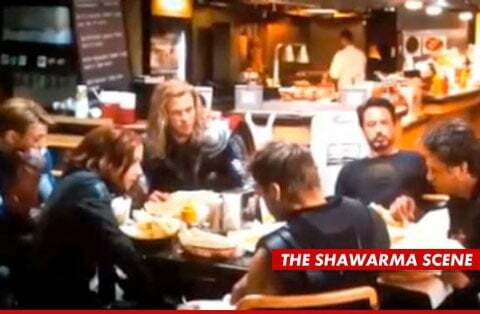 Has The Avengers Sparked A Surge In Shawarma Sales? First off, this news item contains elements specifically relating to the after-the-credits scene of The Avengers, so if you are among the few who have not yet seen the superhero-studded box office juggernaut yet, know that there are spoilers ahead. Now, as those of us who stayed through the credits know, the last shot of the Avengers the movie shared is not that of the heroes parting ways in Central Park, but of the group—still in battle gear—sitting down to have a quiet and ravenous meal at a shawarma place that had caught Iron Man's interest during their epic Manhattan battle. If that scene made you yearn for the mouthwatering Arabic meat dish, turns out you're not alone. According to TMZ--which yes, means we're taking this with at least a grain of salt—shawarma sales at at least one Los Angeles restaurant are up 80%. With a bit of their trademark cheek, the site notes they contacted "several different fine eating establishments all across Los Angeles ... and they all say sales of shawarma went through the roof this weekend," but note it was a manager at Hollywood's Ro Ro's Chicken that put a number to the spike. While the research is anecdotal if not specious, I'm willing to believe there's been a surge in shawarma sales as Tony Stark is a pretty solid pitchman. Yet it's pretty ironic that of all the product placement in the movie's final battle scene—where trucks, phone booths, and bus stops all boast ads—this is the sales spike people are talking about. Much has been rumored about the final scene, but I must admit, I'm curious if that t-shirt draped on a chair behind Tony's head isn't the key to The Avengers secret shawarma hangout. If you know, it please do share in comments.